Light: Refusing to worry about what you cannot control. Rejecting anxiety. Judging your own performance with kindness and gentleness. Using meditation to quiet a troubled mind. Confronting nightmares and fears. Drawing a conclusion and putting an issue out of your mind. Shadow: Torturing yourself with regrets. Second-guessing your every move. Beating yourself up for your mistakes. Depression. Obsessing on errors and overlooked details. Refusing to handle stress in healthy ways. Ruining your ability to appreciate the present by dwelling on the past. Debating irreversible decisions. Story: The Main Character agonizes over a past mistake. Relationships. Comparing your current relationship to past or fantasy relationships is a formula for discontent and depression. Rather than wring your hands, say what’s on your mind. Don’t allow your past mistakes to smother your delight in the present. Work. The blame game can gobble up unlimited hours and energy; don’t play it. Review errors only with an eye toward improving future performance. Instead of dwelling on missed opportunities, define what must be done to create new ones. Spirituality. Everyone has regrets. Rather than be strangled by them, use your regrets as a means of enhancing empathy for others. Understanding that we’ve all made mistakes can help us remember to cut everyone a little slack. Use your pain to gain insight into the pain others feel. Personal Growth. Worry wastes energy. If something happens, it happens; the energy expended on worry won’t change a thing. Do what you can do, and let the Universe handle the rest. Maturity dictates letting go of unhealthy obsessions and learning to be happy with the here and now. Fortune Telling. If you take the action you’re considering now, you’ll be sorry in the future. When? Between June 1st and 10th. The Rack of Swords. 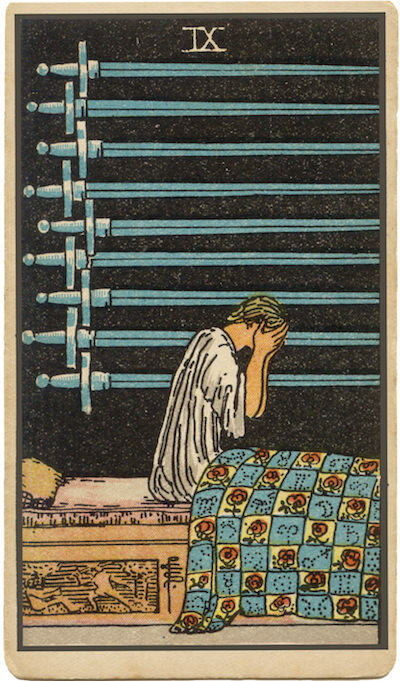 In the RWS, the Swords in this card point forward, suggesting a dread of future events. If you pause to define exactly what you fear, you may find that you diminish that fear’s ability to rob you of a good night’s sleep. The Distraught Figure. In illustrations for this card, postures of agony abound. Consider how your inner emotions are shaping your posture (and, by extension, your approach to life.) How might a change in posture elicit a change in your circumstances? Finding an Answer. Logic has taken you as far as it can; beyond this point, all you can do is call into question (and devalue) the good work you’ve done. It may well be time for you to make a choice—and stick with it! The Marseilles Image. The ninth Sword appears: stunted and blunted. Its decisive blade is trapped, interlaced with eight other blades, useless. There is a point at which logic and questions are no longer useful; pressing beyond this point does nothing but trap us. Perhaps it’s time for you to shift from debate…to action? What role does worry play in your current situation? To what other ends might you devote the energy you’re giving to anxiety? How can you know when it’s time to stop thinking and start acting?